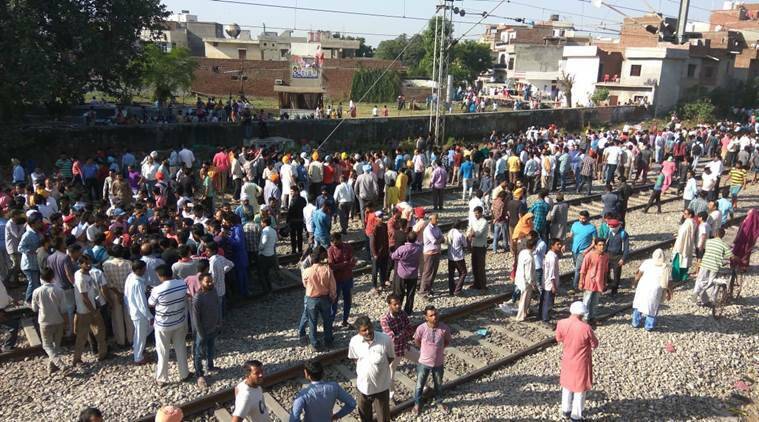 For two weeks, the Indian Railways maintained that the October 19 incident in Amritsar, where 59 people were mowed down by a speeding train, was not a “train accident” but a case of “trespassing” and, therefore, did not qualify for an independent statutory probe from its side. But on Friday, the Railways finally announced an investigation by the Chief Commissioner of Railway Safety (CCRS) into the incident. Railway Minister Piyush Goyal took the decision after Congress MP from Amritsar, Gurjeet Singh Aujla, met him and demanded a probe. Aujla had written a letter to Goyal and the Ministry of Civil Aviation, which controls the CRS organisation, on October 23. Railway sources said CCRS S K Pathak sent out notices Friday to the local Superintendent of Police and other senior officials of the civil administration to depose before him on November 4 and 5. Pathak will also take detailed statements from all railway functionaries concerned, notably the station staff, those manning the nearest level-crossing and the driver of the train. As per rules, any member of the public can also depose before the committee. The CCRS will reach the Amritsar site Saturday evening. In his letter to Goyal, Aujla has argued that as per the Railway Act, 1989, the “decision of Railway ministry to not consider this as a reportable accident is incorrect”. Citing Section 113 of the Act, Aujla has argued that since the accident involved loss of lives, the Railways was bound to refer the matter to the CRS as a “reportable accident”. “They (victims) never noticed (the) approaching train as the noise of crackers was loud… and no alert was raised by the (level) crossing in-charge,” the letter stated. On October 21, The Indian Express reported that Sections 113 and 114 of the Act allowed the Railways to notify “any accident of any other description” — not just derailment and collision — involving “loss of any human life” as a Railway accident. The CRS probe processes technical evidence of processes and events leading to accidents and is considered a thorough, third-party inquiry. “As per law, in such cases, it is not mandatory to conduct inquiry by Chief Commissioner of Railway Safety (CCRS), but it is not impermissible either,” Railways said in a statement Friday. “Though, prima facie, Railways does not appear to be responsible in this incident, issue of inquiry by an independent and technically competent authority not reporting to Ministry of Railways was considered….” Before ordering the probe, Railways also checked that in the past the CRS had, in fact, probed run-over cases on railway tracks.